I have a friend who is nuts about Fluer de lis. I like them also because they are classic for any wardrobe. 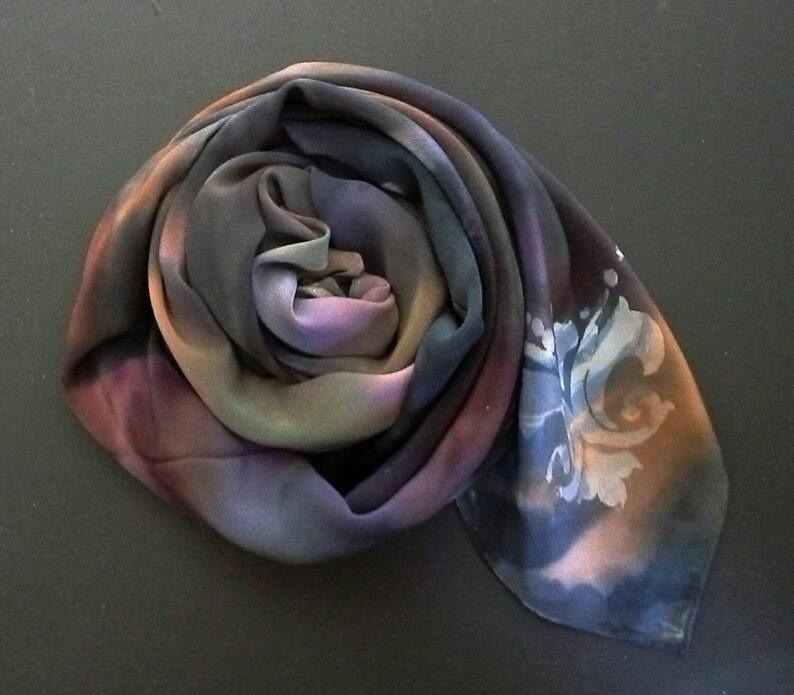 There is such a richness about the deep blues and muted purples of this silk crepe de chine scarf. It is extremely classy! One-of-a-kind beauty with fluer de lis on the corners of this 44x44" silk scarf. Wearable art will make a statement about you! You'll be stunning and sure to turn heads! A hand painted scarf is also a great gift because no one will have the same thing, they fit everyone,it can update a wardrobe in a heartbeat. A scarf can also make one of the best travel accessories because they are light and take no room in a suitcase. My expression of art is whimsical and wild. I love abstract and figurative art. Over my many years of painting, I found my own unique style and have stuck to it. I’m extremely influenced by nature because of the colorful world we live in. I am a swimmer and love anything having to do with water. I guess that is why the medium of silk painting was a natural for me. In my shop, you will find landscapes cityscapes, portraits, florals and abstracts.